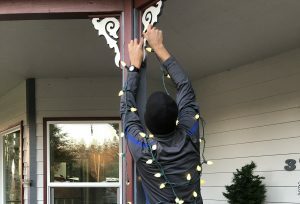 Early one Saturday morning, just days after Halloween, Luke and Whitney Bowerman begin hauling strings of lights and Christmas decorations out from their garage. The layout takes hours, but is a necessary step, since they often find their own early Christmas surprise in the form of a decoration that they forgot they bought late the year before. 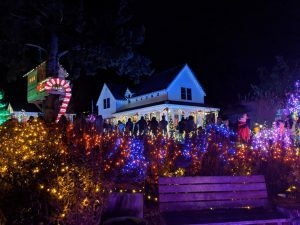 The layout step is an important part of planning the unique yearly creation that is Oly Lightstravaganza, and annual light display the couple creates at their home for the enjoyment of the community. 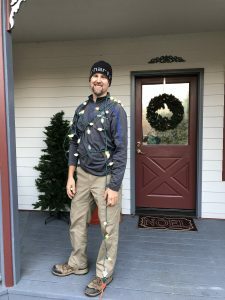 If you’ve just started thinking about putting up some Christmas Lights, Dwayne Boggs from Boggs Inspection Services and the Bowermans have a few things for you to keep in mind before to start your holiday decorating. Begin by inspecting all lights and decorations before you get started with hanging and placement. Replace bulbs and fuses as needed. And look for any areas where wires insulation may have worn away exposing it to the elements. Decorations or string lights with worn or frayed wires should be recycled or properly disposed. During the holidays, some stores offer holiday light recycling, so keep an eye out for string light recycling collection boxes, or check out the Thurston County Public Waste website and the Earth911 online database for recycling options. Ladder safety is especially important during the cold months. Even if temperatures aren’t below freezing, rain or moisture in the air from fog can make ladder steps, pathways, and lawns slippery. Use caution, and always use the correct size ladder for the job. Ladder work is best done as a team, with one member of the team holding the ladder steady. “Never reach while on your ladder,” says Luke, ”even if it seems like a lot of work to move the ladder a few inches over, leaning is not worth the risk.” Do not use the top rung of the ladder as a step, unless it was specifically designed for that purpose. Ensure that step stools and ladders are placed on sturdy surfaces. Do not attempt to move or shift a ladder with someone on it. Keep indoor decorations inside. Many lights these days are sealed for indoor/outdoor use, but always double check to be sure. Another important thing to remember is to use only outdoor extension cords outdoors, something that is easily overlooked. Ensure that cords are kept off walkways so they don’t become a tripping hazard, and make sure cords do not sit in low spots where water collects. Be careful to not overload circuits. With most decorations using LED lights now, it is difficult to overload a circuit, but care should still be taken. A good rule of thumb is to not attach more than 3 strings of lights to each other and to use several outlets to space out your usage. When hanging your lights, do not use stapes or nails to attach lights to your home’s exterior. “These items can wear away the protective wire insulation resulting in an electrical shock or fire hazard,” says Dwayne. Light clips are a useful, inexpensive solution perfectly designed for the task. Zip ties can also be used to attach light strings to handrails or vegetation. Use care to prevent cords from becoming crimped or pinched in doorways or by windows. The Bowermans just celebrated their eighth opening night on November 25. 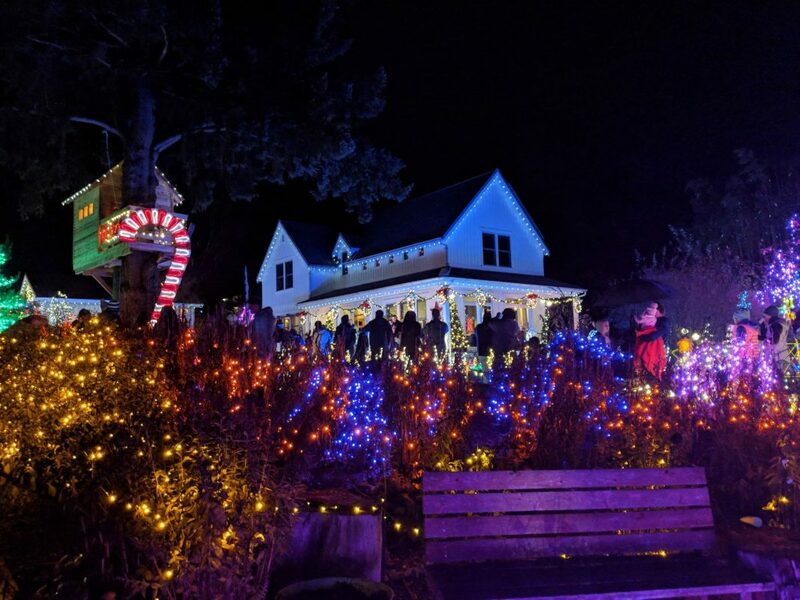 Oly Lightstravaganza can be found at 1515 10th Avenue SE in Olympia through New Year’s Day from 4:45 p.m to 10:30 p.m. They encourage you to come visit them and see their spectacular walkup display of over 75,000 lights. Weeknights are generally less busy than weekends, and the display gets busier closer to Christmas. Please be courteous to the neighbors and be prepared to walk a bit if it is a busy night. The couple maintains a donation box for the Thurston County Food Bank which accepts non-perishable food donations, as well as cash donations. 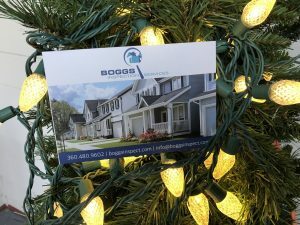 Whether you plan to have thousands of lights like Oly Lightstravaganza or something a little more modest, Boggs Inspection Services encourages you to keep safety in mind for a magical holiday season.